Right now the average reader spends their time in multiple reading apps. They might use Aldiko to read ebooks, Feedly to stay abreast of news, Instapaper to catch up on longer articles that have been saved, and Readmill to share annotations with fellow readers. How would you like to combine much of that reading time into a single app? If that sounds appealing then I have an app for you. One of my readers has just tipped me to dotdotdot. This app seeks to combine elements of the distinct and differentiated reading apps mentioned above into a single coherent reading experience. Rather than going for just a single type of content (fiction or non, short or medium or long, self-curated or community-promoted), dotdotdot wants to be the jack of all trades for reading. There are a number of different ways to load content to read. You can log in to your Google Reader account and read the feeds, load DRM-free Epub ebooks from the web or from Drpobox, and there is even a web browser built into the app that you can use to search for and import content. None of those features are new, but it's a little unusual to see them in a single app. 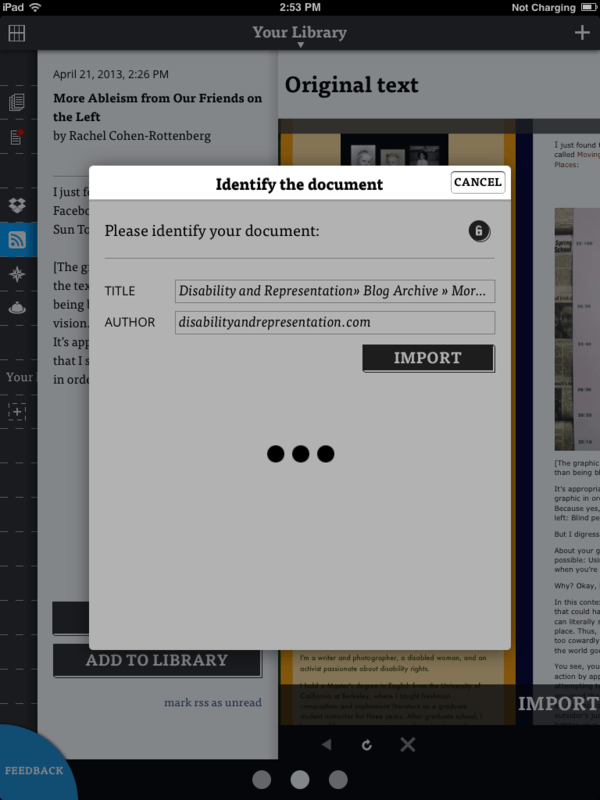 And the annotation and sharing options add even more ways to read. 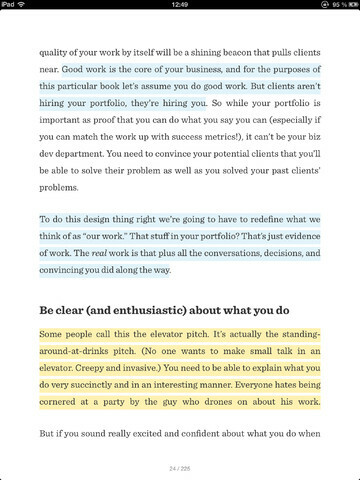 Dotdotdot app supports both notes and highlights, which can be private or public. You can even search your notes (or the tags attached to them) all at once - now that is a feature I appreciate. I don't know about you but this is the kind of app I always wanted. For some years now I have been trying to replicate what dotdotdot can do by using various apps to get content into my preferred reading app. I've exported articles from Instapaper as ebooks, used the dotEpub bookmarklet to capture and convert a webpage so it can be read offline, and I've even used Feedbooks' RSS-to-ebook tool when it was still available. All of those tricks were clunky at best, so I am really hoping that dotdotdot will be able to grow into a serious alternative. But dotdotdot is still in a very early beta (the oldest coverage I can find is from January), and it is limited to just an iOS app and the website. It's also missing several features I want; there are no formatting options and dotdotdot is still dependent on Google Reader. The latter issue is a serious concern, and it is half the reason I want to use this app. This app is also missing a couple ways that I would like to add content (I'm never happy). It would be useful of I could tie in my Twitter account so dotdotdot could grab all the links I tweet, and email would also be useful. In fact, once I can email content to dotdotdot I don't think it would need much else in terms of 3rd-party app integration; IFTTT is surprisingly capable in extracting content from various platforms and it can send emails. I'm told that email support is on the roadmap, and so is an Android app. And of course breaking free of Google Reader is dependent on finding a viable alternative. In spite of the issues this is definitely an app that is worth watching, and it's just one of number of cross-discipline reading apps I expect to see this year. The imminent demise of Google Reader is already having an effect in the news reader niche, and I fully expect the competition over the next year or so to redefine that niche. There are any number of tech companies angling to replace Google Reader, with Feedly, Zite, and Digg all having thrown their hat into the ring. I am expecting one or more of these tech companies to follow the lead of dotdotdot. I think someone will expand the abilities of their news reader platform so it can do more than just read the news. TBH, we're already seeing signs that this is happening. Feedly went from just looking pretty to also being functional. Flipboard went from picking content for the reader to also letting users build their own magazines. 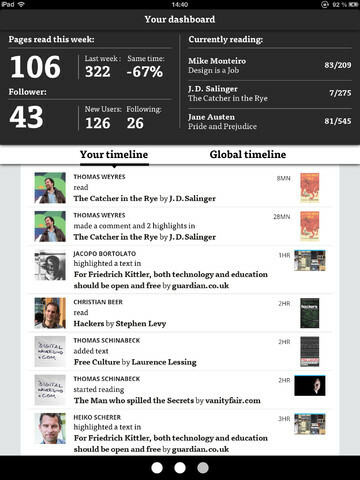 And even Zite unbent enough to let readers import content from their Google Reader feeds. But those are really just enhancements that focus on the news reader niche; they don't really cross boundaries like dotdotdot has done. Nevertheless, I expect the boundaries between the various types of reading apps (ebook, feed reader, save for later, news aggregator, etc) will get rather fuzzy this year. And that is a good thing because the boundaries dividing the various reading apps are both artificial and arbitrary. For the most part they are a vestigial holdover from the way that we used to read content on paper, and the same goes for the labels we use to describe the content we read. eBook? Article? eSingle? None of those labels are intrinsic to the content they describe, but instead are convenient handles that we have hung on chunks of digital content so we could better explain it to ourselves. Once you look past the labels you will see that digital content is digital content is digital content, all of which is streamed in one form or another. I suppose this all sounds awfully metaphysical, but when we throw out all the vestigial holdovers from our paper past we also throw out the assumptions that are attached to the labels. And once the false assumptions are gone it is possible to see what should have been obvious all along. That's when we end up with new ideas taking old, including ideas like The Magazine (startup tech company concept as applied to magazine publishing). P.S. And to think I was considering changing the focus of this blog. Silly me. P.P.S. If someone wants me to explain what I mean about The Magazine I can do so in another post. This one is already too long. You may have missed it, but you commented on the article that accompanied the feature. So you were aware of it, you just didn’t know you were aware of it. They have interesting prospects, I think. I’m embarrassed to say I missed your article on dotdotdot completely, and it wasn’t the only article I missed. I didn’t realize you had covered it until I was fact-checking my post with past coverage. Edit: Okay, now I can see why I missed it. You described dotdotdot as a social reading site, a topic I’m not interested in.